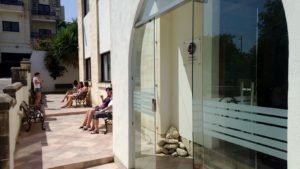 Gateway School of English GSE (Malta) is located in a quiet and elegant residential neighbourhood close to the vibrant St Julians’ Bay area (12 to 15 minutes’ walk from St Julian’s Bay or Spinola Bay). The location was carefully chosen from a shortlist of over ten other possible locations because of its ideal combination of desirable features: social quality of the neighbourhood, security and safety, low building density and closeness to green zones, accessibility from and proximity to important shopping and recreational centres. The building was specifically designed to ensure optimal conditions for effective learning. The School is a semi-detached two-level building comprising eight bright and spacious classrooms, as well as common areas and plenty of indoor and outdoor space for relaxation and recreation. Additionally, the adjacent school residence was designed to provide a comfortable and modern home for those students at GSE who choose to live as close as possible to the School. Eight bright and spacious classrooms fully equipped with the latest information technology and video facilities. Our teachers make full use of these and other resources to make the best use of your time in the classroom. A well stocked library with contemporary learning materials and media for practising and developing different language skills. We have fiction – graded readers from beginner to proficiency (National Geographic Read Listen & Watch Series and Macmillan readers) – as well as exam practice materials and a broad range of additional grammar and vocabulary resources. In addition to computers for self-study, the Library contains DVDs, books, magazines, worksheets and specially selected listening materials. It is open before and after classes and professional assistance is available at all times. A large courtyard and gardens where you can relax at break times and after classes. Free 24 hours a day wireless internet and internet-cabled computer workstations which enable you to keep in touch with your office, family and friends world wide are also available at the adjacent School’s residence. Both the School and its adjacent residential complex are completely and fully air-conditioned.